Overt techniques are in-design techniques that can be seen and that are used to create a variety of stunning 3D, 2D, pattern and gradient effects. These techniques have as much to do with style as they do with security. On one hand, these techniques can be used to create visually impactful labels that can help bolster any brand. On the other hand, these techniques provide the first level of defense and security against counterfeiting. Please have a look at our overt in-design techniques below. For demonstration purposes, each technique is shown as part of our own sample hologram label design. Clients can request physical sample labels from us in order to see how these techniques function in the real world. 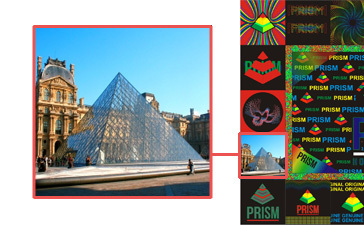 This effect creates the illusion of a 3D object embedded into the hologram design. The object’s perspective shifts as the label is viewed from different angles. This effect is difficult for counterfeiters to reproduce and also adds an impressive visual quality to the label. As the label is shifted from one angle to another, certain objects on the label will switch from one 3D or 2D object to another. Both these elements will not be viewable at the same time. Switch can also be performed in the background layer. Different from a True 3D effect, this gives the the illusion of depth such that certain objects exist behind or in front of others. Objects that are given this treatment, will appear to change in color as the label is shifted from one angle to another. The object will have a rainbow effect that cycles through each color of the rainbow. Objects appear to shrink and expand when the label is shifted from one side to another. This type of effect is seldom used by other hologram manufacturers and is therefore difficult to counterfeit. Kinematic patterns or guilloche patterns are complex line patterns that often appear on currency and certificates. These patterns can appear static or dynamic (kinetic movement). Due to their complexity, these patterns are very difficult to reproduce and provide stunning visual effects. Similar to the shrink / expand effect, this treatment gives the illusion of an animated image as the label is shifted from one angle to another. For example, an animation of a flying bird can be used. 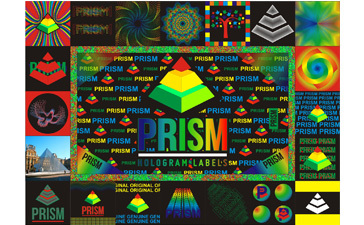 Typically, elements that appear on a hologram label cycle through the colors of the rainbow as the label is viewed from different angles, appearing dynamic. This effect attempts to lock the colors of the object to keep them static. Shine effect gives objects a brilliant, precise and highly reflective appearance. This creates great visual effects. Sparkle effect, also known as glimmer effect, gives holograms a highly dynamic and glamorous appeal. This effect is rarely used but provides a stunning visual show.